Last year, I got what is the best gift I could ever get from a student. I got a pewter sake cup. My student loves sake and we were talking about ways to enjoy it and she raved about how a pewter cup is the best way to enjoy sake. It enhances the flavours of the sake and helps keep it cold. Since I love drinking cold sake, she really recommended me to try drinking sake from a pewter cup. Unfortunately, it is very difficult to get a pewter sake cup in a restaurant so the chances of me drinking sake in a pewter cup were slim to none. 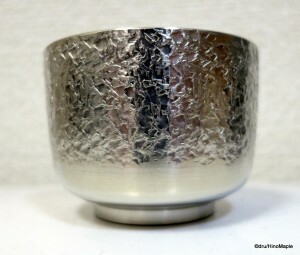 That was until my student gave me a wonderful gift, a pewter sake cup. I was very surprised by it as I knew it must have been expensive. It is one of the few gifts that I will cherish and remember for a long time to come. Needless to say, it has been well used and it allowed me to research the company and dream of owning more items from them. Pewter, for those who don’t know, is a tin alloy. It is mainly comprised of tin with a few other metals mixed with it. The cup that I received was from a company in Kyoto called Seikado. They were established in Kyoto in 1838 and they are the only pewter art craft shop left in Japan. They take their work very seriously, from the looks of things. They ensure they use specific metals for different uses, such as pewter for kitchen items, silver for tea ceremony items, and copper for tea kettles and such. Their website has a lot of information about the various items they make and sell, and even the Japanese website has English descriptions. Pewter itself, rather any metal, is very popular in Japan when it comes to cups. It is very common to go to a department store and see pewter, silver, and copper cups for various uses. It is most commonly used for beer and if you find a shop that has a copper beer cup, specifically the Pronto café chain, it is likely they will charge you a premium just for the cup. While I don’t find a huge difference in the taste for beer, it is very nice to drink from metal cups as it does have a cooler taste. In terms of the taste, I can easily tell a difference when it comes to sake. At first I thought that the pewter would affect the taste in a negative way. 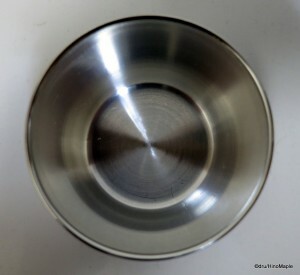 It is common to avoid using aluminum or other metals as they transfer into various food items and causes the flavour to have a metallic taste. Thankfully, the pewter sake cup didn’t have such a problem. When doing a side by side comparison of the same sake, I can tell you that the pewter is better. For someone who doesn’t drink a lot of sake, it is highly likely that they won’t notice a difference, but there is one. If the sake isn’t very good, rather I’m not fond of the taste, I can easily pour it into the pewter cup and it will taste better. Since pewter is a metal, the conductivity of heat is higher so my lips feel a chill when drinking cold sake. This helps with the overall taste of the sake, making it better in my own opinion. While I don’t have to drink sake in a pewter cup all the time, I do find that it is much better to do so. If you are a sake lover, like me, you have to try it someday. This entry was posted in Culture, Food and tagged alcohol, art, choko, cup, japan, Japanese sake, nihonshu, Ochoko, Pewter, Pewter Art, sake, sake cup, Seikado, Tin by Dru. Bookmark the permalink. 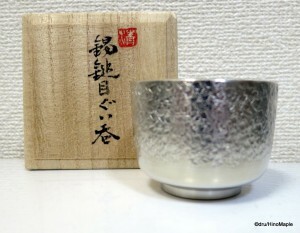 I had never thought of getting a pewter sake cup before. It feels too cold.